You may recall that I often poke around the kids aisle to look for healthy (and yummy) foods that might be good for an adult diet. I love kids size foods like fruit mashups, snikiddy fries, snikiddiy pizza puffs, and ian's cookie buttons and that I have posted about before. I like these types of foods because they usually feature small portions and thus, fewer calories, and almost always better ingredients. One product that caught my eye recently was by Nature’s Path – EnviroKidz Bars in peanut butter, chocolate, or berry. These yummy bars are not only organic, but they are also gluten free, which is great for those who have celiac’s disease or are sensitive in some other way to gluten. EnviroKidz bars are packaged in boxes of six, and each delicious bar has just 110 calories, one gram of protein, one gram of fiber, and 3 weight watchers points plus points. I like that these bars from Enviro Kidz are made using organic brown rice flour and organic milk chocolate (at least in the chocolate bar). They also list organic molasses among their ingredients, which I really like as a sweetener. The peanut butter version is so peanut-buttery, which makes it extra yummy (I do love peanut butter). These are perfect for carrying around with you for a low calorie afternoon snack or as backup in case you get hungry while you are out and about. 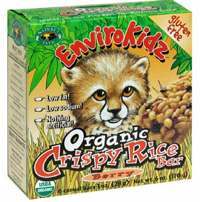 You can buy EnviroKidz bars at natural food stores, like Whole Foods or online at Amazon.